Middleweight multi-purpose 26″ MTB wheels. Light and strong, angular style box section rim, with eyelets and a stable screw-pin joint. The front wheel features the Halo MT front hub and the rear comes with the choice of either a sealed bearing Halo Spin Doctor hub or a loose bearing single speed Combat hub. 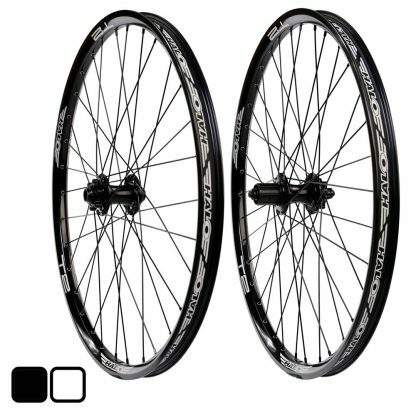 Both wheels come with black ED finished spokes. The Black Anodised finish 32mm rims are suitable for Vs or Disc brakes, whilst the White Powder coated option is recommended for disc use only. Note: Anodised finish rims will accept V-brakes, but naturally, the brake surface colour finish will wear.